Students spent 30 consecutive hours of engineering design, teamwork, and development at HWeekend on October 8-9, sponsored by the College of Engineering. The theme was “Show’em What You Got!”, and participants did just that, creating some of the most complete projects of any HWeekend. The purpose of the theme was to encourage projects that could be submitted to national competitions. Audrina Hahn solders components to a Teensy board. 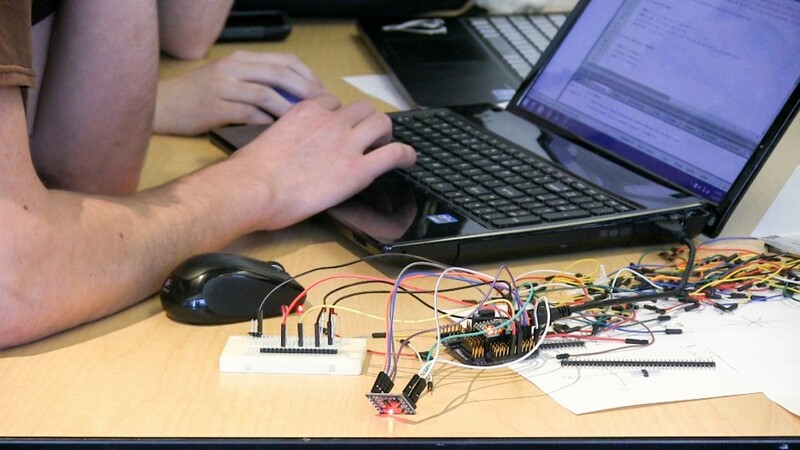 It was the sixth iteration of the highly successful event that gives engineering and business students an entire weekend to develop an idea and prototype it. Forty-two students participated with majors in electrical and computer engineering, computer science, mechanical engineering, nuclear engineering, and finance. After some breakout brainstorming sessions and presentations of their ideas, participants split into 10 teams to work on their projects. The diverse ideas included a modified game of laser tag, a guitar that could tune itself, and a smart shin guard paired with a virtual reality environment. One of the groups returned from the previous HWeekend held during Spring term. That group continued with their effort to build a ferrofluid display using individually wound electromagnets. The other groups were much newer to their projects, such as the mobile coffee heater group, which worked on finding components they could use to heat liquids in a drinking cup. “The beautiful thing about this is that it’s fast paced and you really see results, even if they’re not exactly the results you hope for,” says Audrina Hahn, a mechanical engineering student, who worked on the Open Laser Tag project. 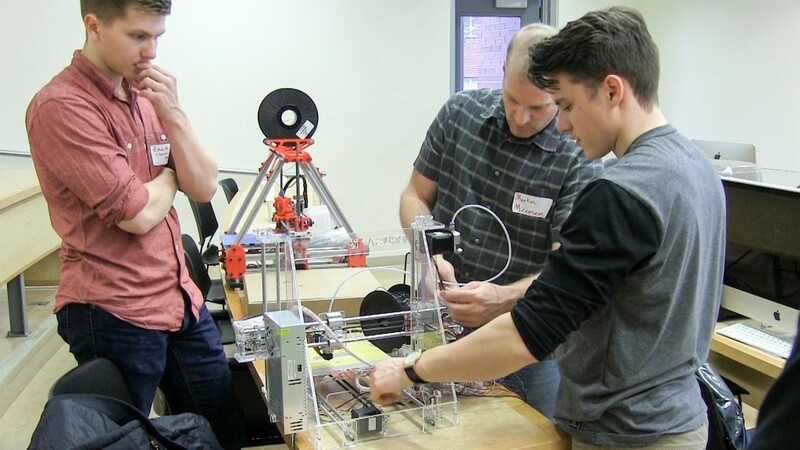 This event made use of the all-new Buxton Hall Makerspace, the Mastery Challenge lounge, and the Virtual Makerspace, which gave students access to 3D printing, soldering irons, a drill press, and laser cutting. “It’s really amazing all the resources that we have available to us that are really simple to use and are things that are up-and-coming that we will probably continue to use into our careers,” Hahn says. A mentor from Intel assists the VR shin guard group. Mentors for this HWeekend included eight industry representatives. Martin Held from Microsemi returned to guide teams and answer hardware questions. 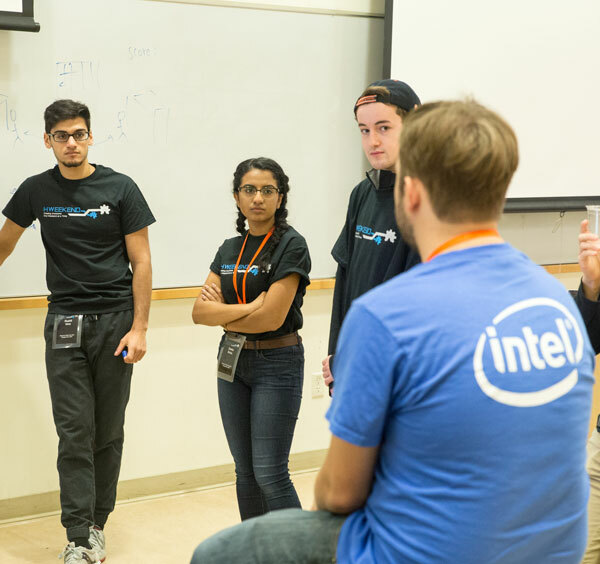 Multiple mentors arrived from Intel in Hillsboro, including several recent graduates of Oregon State. These mentors split up to help on projects where their experience helped groups work with unfamiliar technologies. One group that benefitted was the motion tracking robot team, which received help with OpenCV from a mentor who revealed a personal interest in assembly programming. Ben Buford was one of the recent graduates who came back from Intel to provide mentorship. He spent most of his time contributing to the ferrofluid display. “I love seeing people come up with quick solutions that let them accomplish something and overcome obstacles that they didn’t know existed three hours prior,” Buford says. Beyond the satisfaction of completing prototypes of their ideas, students at HWeekend compete for two group awards. The Executors award goes to the team that produces the best execution of their original idea to create the most polished final product and the Helping Hand is for the team that contributes the most to other teams. At this HWeekend, the Arbitrarily Tuned Stringed Instrument team was selected for both awards. The team included members Keaton Scheible, Youthamin “Bear” Philavastvanid, Elliot Highfill, and Savannah Loberger. Posted in Events, Student Stories, Uncategorized. 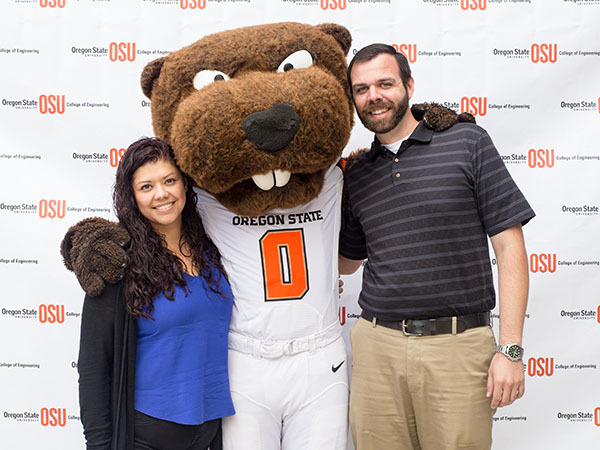 Lizbeth Marquez and Nick Malos, advisors for the School of Electrical Engineering and Computer Science pose with Benny the Beaver. In their role as advisors, Lizbeth Marquez and Nick Malos help hundreds of students in the School of Electrical Engineering and Computer Science navigate their way through college. Their goal is to help students succeed and ultimately earn their Oregon State degrees. According to a recent report from the Commission on the Future of Undergraduate Education, only 60 percent of college freshmen get a bachelor’s degree within six years. While there are many reasons students don’t complete their degrees, Lizbeth and Nick have some advice to offer to help you succeed. College can be different from high school in that high school teachers tend to lead you through all the homework and due dates. In college, the professors post the assignments — often for the entire semester — and expect you to be prepared. Get a planner, use a smart phone app, or get a wall calendar — whatever it takes for you to know when assignments are due. It may be your dorm room or a cozy corner of the library, but find a place that works best for you to get your work done — while avoiding as many distractions as possible. There are many places to go such as the MU, the Valley Library, your residence hall, or most buildings on campus! College life can be chaotic with various academic and social events. Make sure you stay balanced and don’t overload yourself. One way you can do this is by visiting OSU’s Mind Spa. You may feel overwhelmed with being homesick or feeling like you don’t belong. We encourage you to consider joining a student group (and be careful not to go overboard), whether it’s academic, religious, athletic, cultural, or social. You’ll make new friends, learn new skills, and feel more connected to OSU. Most schools and colleges offer study tables or have tutors available. If you’re having difficulty, these resources are another tool available to you. Another idea: Talk to your classmates about getting a group together to study. It is important to remember there is no one “right” or “best” major. You should select a major that aligns with your skills, interests, and goals. Talking with a career counselor in the Career Development Center can help you explore the options. Don’t be afraid to change your major. It is estimated that about 80% of undergraduate students across the United States change their major at least once (National Center for Education Statistics, n.d.). It can feel intimidating at first, but it is important to get to know your fellow students because they can be a great resource. What better way to find others who share your same interests? Talk to your professors and attend their office hours. I promise they are not as scary as you might think. Professors are here to help you learn the material, challenge you to think outside the box, and further your understanding of the subject. They are also a great resource when you need letters of recommendation for scholarships, internships, or graduate school. Just remember, the better they know you, the easier it is for them to write a quality letter. Take advantage of campus resources such as the Engineering HUB, Mole Hole (Chemistry), Worm Hole (Physics), Math Learning Center, Writing Center, etc. It is important to speak with your advisor early and often. They are the ones who will provide you with your registration pin number. But more than that, they can assist with course selection and planning; registration; understanding major and degree requirements; and navigating the processes to find extracurricular opportunities, internships, jobs, and more. A diverse group of students from 10 different majors traded sleep for creating a marketable product at Oregon State University’s HWeekend on January 16-17. In just 30 hours, 11 teams built devices ranging from fun to serious — including a spider robot, a wearable musical instrument, and a “smart” mask air filter — and pitched their product to a panel of judges. 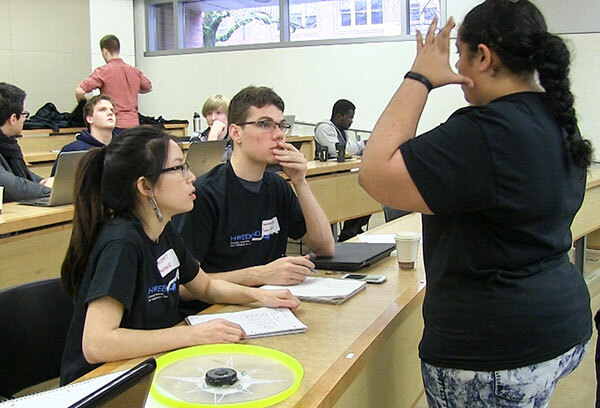 The fifth HWeekend, hosted by the School of Electrical Engineering and Computer Science, expanded this time to include business majors, with the collaboration of the Austin Entrepreneurship Program (AEP). At the beginning of the event students pitched their ideas to each other and formed groups based on interest. 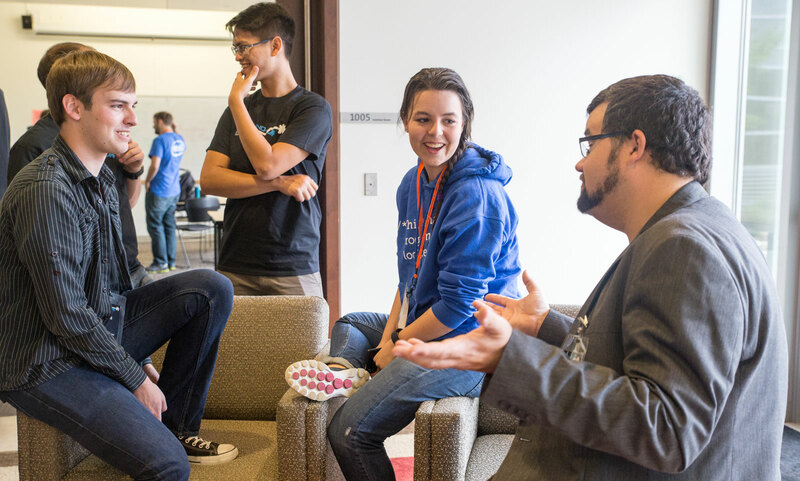 Mentors were on hand to help the teams develop their idea into a prototype. “It was fantastic work by all the teams and it was really hard to decide on the winner,” said Dale McCauley, program manager of the AEP. In fact, the judges could not decide on the top two and instead awarded three prizes. 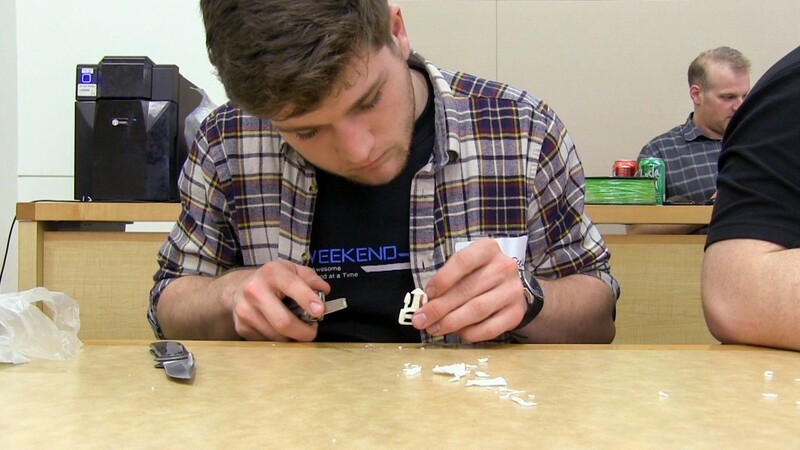 Zack McClure, a student in chemical engineering, participated for the first time. He admits he did not know what to expect coming into the event and was pleasantly surprised at how well the team formation worked. “We have all different majors on our team — chemical engineering, computer science, electrical engineering, renewable materials and mechanical engineering — we have no duplicates, but a perfect overlap and ability to mesh with each other,” McClure said. Savannah Loberger, a computer science student, was also a first time attendee and was part of a multi-disciplinary team that included electrical engineering and business students. Loberger‘s team, Illumin8, won the top prize for an LED device that could be controlled wirelessly for events like football games. Second place winners were Comfort Coozi, a temperature-controlled, heated sleeve for disposable coffee cups; and Spider Minions, an eight-legged spider robot. Participants also voted for the best executed project which was awarded to My Baton, a musical instrument that can be controlled by hand movements. The Helping Hands award was given to the Bio-Shock team for being the most helpful to other teams. HWeekend was sponsored by Rockwell Collins, the College of Engineering and the Austin Entrepreneurship Program. Hanna Anderson, sophomore, electrical and computer engineering. As a freshman, or maybe even a sophomore, college can seem a bit daunting. Classes are harder and larger, there are three-hour labs, recitations, financial aid, football games, pressure to start research, Greek life, midterms, new friends and 10 weeks later there’s finals week. All of these events and aspects can pile up and before you realize it, you’re drowning in a first-year mid-term crisis. As an entering sophomore in electrical and computer engineering here at OSU, I can recommend some resources and tips to help you through the hard times. Even in college, sometimes it can be hard to make friends, or find people you have a connection with. Joining a student group or club can be a great way of connecting with other people and having some great experiences! I joined the marching band last year, and was given the opportunity to perform in front of the entire football stadium each game, as well as travel to several away games. It was a great experience meeting all the other 200+ members and seeing us all come together for one common purpose. There are dozens of student groups and clubs on campus, many of which might fit your interests in and out of the classroom. 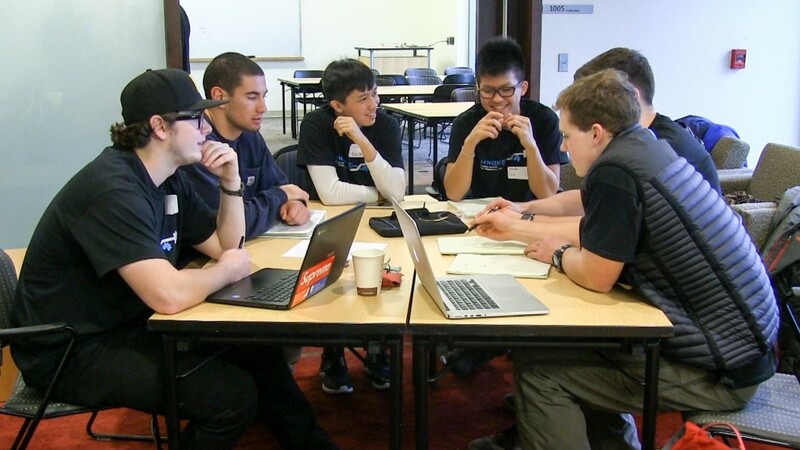 Whether its building rockets, cars, robots, or mobile apps; working on open source software; or even bass fishing, check out the engineering-specific clubs or the many other inclusive student groups at Oregon State. For those of you who may have no previous robotics or electrical experience, do not be worried. I personally was not a part of the robotics team in high school, nor had I ever had any real electrical experience, and I have managed to survive with very little wear and tear. However, if you are worried, there EECS peer mentors who are more than willing to help you out. Peer mentors are EECS students who can help you navigate the ins and outs of being an EECS student. They can assist with academic questions and are available for advice about classes, internships, clubs, and other opportunities. It’s never too early to start thinking about internships and work experience. Having work experience in your field before you graduate will greatly enhance your employability when it comes time to look for a job, but it can take bit of hard work and perseverance. Simply sending an email, or talking to a professor after class, or attending office hours are all great first steps to making your name known. 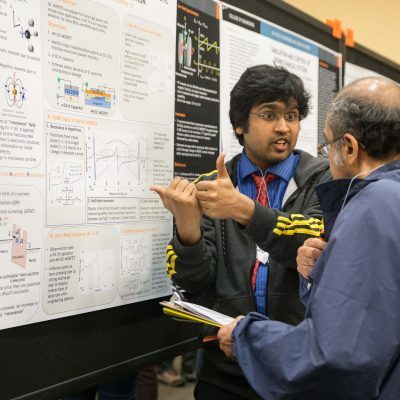 The School of EECS provides students with many opportunities to connect and gain experience. Also, making a connection with your academic advisor is a great way to find out about other opportunities. The transition to college may be a hard one, or may be an easy one. It all depends on each individual person. While this is true, it very important to keep tabs on your mental and physical wellbeing. The “freshman 15” is indeed a very real thing, as well as the possibility of declination of your mental well-being. The most important thing to combat both of these two happenings is to be cognitively aware of your decisions, and realize that your brain makes those decisions, and your body carries out those decisions. If either one is not working at its prime, things start to slip. You don’t need to be in crisis to take care of your mental health; make sure you know about Counseling & Psychological Services (CAPS). The Dixon rec center and OSU’s Recreational Sports have many programs and opportunities for exercise, and relieving stress. Lastly, University Housing & Dining has many healthy eating options to keep your brain and body well nourished. Yes, it may be intimidating to meet with your professors, however they are a great first resource when in need of help. Getting to know a professor may even help you down the road when you are in need of letters of recommendation, and some may even hire you as an undergraduate researcher. Attending office hours is the best way to communicate with professors individually. If their office hours don’t work with your schedule, feel free to send them an email to schedule an appointment. 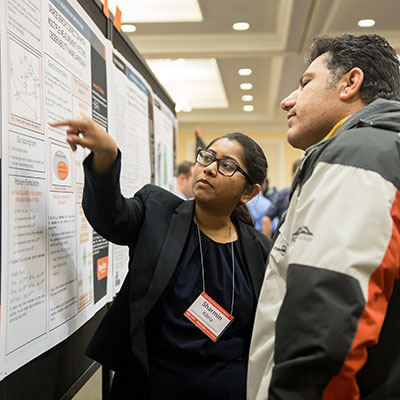 Oregon State and the College of Engineering have many resources for students to receive academic support with their class. The HUB in the College of Engineering has study tables and tutors for subjects such as physics, chemistry, math and electrical fundamentals. There are also engineering specific academic coaches who can help with skills such as organization, study skills, concentration, memory, note-taking, test-taking, and time management. Another resource are the academic tutors in the residence halls. Each residence hall will have a math and English tutor each week, as well as an Academic Learning Assistant who holds office hours every week. Yes, it may be a struggle to get up for class in the morning… However, the knowledge that is shared and the connections that are made while attending class can never be recreated, and whether or not you attend class, you will still be held responsible for understanding the material. Some classes even have attendance as part of a requirement for passing. So just to be safe, go to class. Your advisor will help you make a plan, get involved in extracurricular activities, and advise you about what to do when you are struggling with a class. As a first year engineering student, you will meet with your advisor at least once a term to receive your registration PIN. If you make a good connection with your advisor, they can even help you find scholarships, research positions, and internship opportunities! Or make sure you have them forwarded to other e-mail accounts that you check regularly. This is the only way you’ll receive information from your professors and TAs about your classes and other important information that you need. 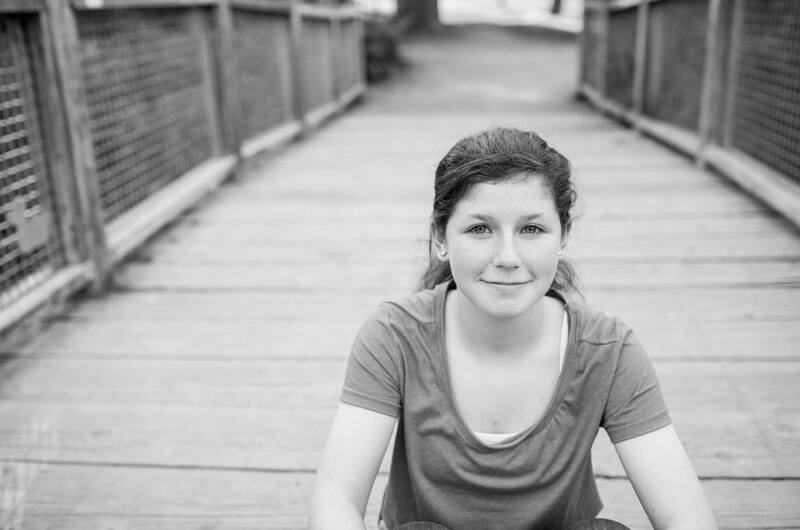 Hanna Anderson is from Bonney Lake, WA, and attended Bonney Lake High School, class of ’14. As a freshman, she was a member of the Oregon State marching band and joined the CreateIT Collaboratory, a program in the School of Electrical Engineering and Computer Science to employ students on projects to develop new prototypes for industry clients. She is now a sophomore in electrical and computer engineering. She decided to pursue an ECE degree because she really enjoys being able to understand how a piece of technology works, and thinking about how she could modify it to make it better. “ECE is a one big puzzle that I am continually being challenged to solve,” she said. In her spare time, she enjoys playing the pianos around campus, as well as going into the Collaboratory and engulfing herself in new fun, interesting projects. Danny Dig integrates lectures and labs in his courses on parallel programming for professionals. Dig’s research focus for the last 8 years has been on techniques for transforming sequential code into parallel code. He is acutely aware of the need for software developers to learn these techniques now that all new devices from smartphones to desktops use parallel processors. In response, he has organized workshops at Boeing and the Illinois-Intel Parallelism Center at the University of Illinois Urbana-Champaign to help professional programmers improve the performance of their applications by using parallelism in software. Dig will instruct the class along with other software experts including Tim Matsson from Intel Corporation who is co-author of the influential book, “Patterns for Parallel Programming,” and Doug Lea, professor at State University of New York at Oswego and the lead architect of Java concurrency libraries. “I teach it as a unique blend of lectures and labs that are deeply integrated. It’s not theoretical, it’s very hands-on,” Dig said. After 30 minutes of lecture, students work on planned exercises on their own laptops with help from teaching assistants. This is the first time he will offer the class in a compressed format over a weekend instead of a full week, to make it easier for software developers to attend without missing work. The shortened course cannot cover all the same content, so he will offer additional resources for the material not covered, and there is a possibility he would offer a follow-up course based on interest. Dig is excited to be hosting the class in Portland, a hub of software development, so he can start building relationships with local software practitioners. 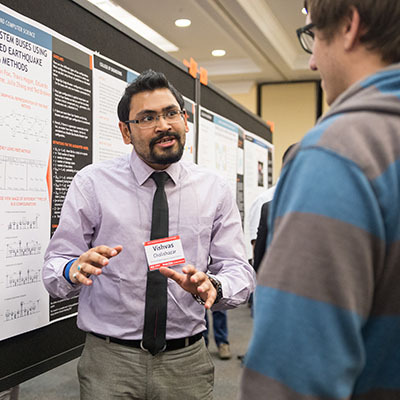 “A constant dialogue with practitioners keeps my research centered and very focused on current software development problems,” he said. But these classes fulfill another need for him as well. “Fundamentally, I’m a teacher and I love seeing the lights go on — it’s my mission in life to help people develop their full potential,” Dig said. 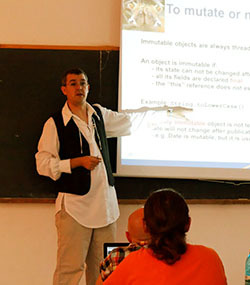 Visit the Multicore Parallel Programming Summer School website for more details.